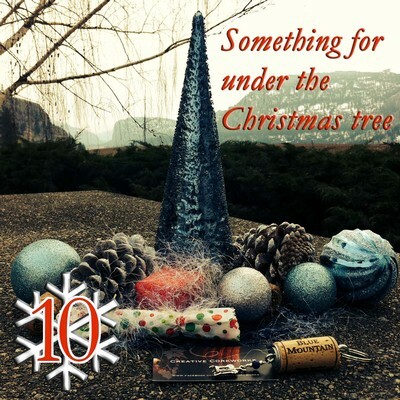 To celebrate a great year we’re toasting with a "12 days of Christmas" giveaway! 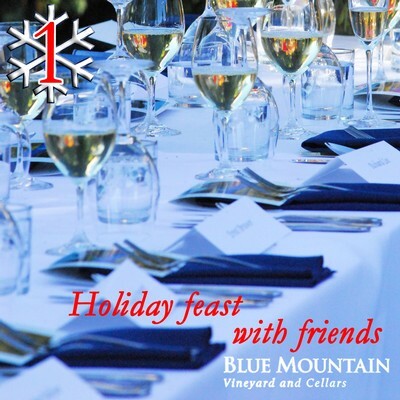 We will feature one Blue Mountain wine or gift for each of the next 12 days along with the perfect holiday occasion to enjoy them or ideas on who to share them with. To win you have to share, like, comment, tweet as much as you can over the next 12 days. One of our dedicated friends will win the dozen!! The details on how to enter are at the bottom of this blog (Enter the contest daily). Check back daily for special offers. Limited to British Columbian residents. If you have any questions, feel free to comment below. Review: Some Okanagan Valley Pinot Gris are fermented and aged in oak barrels and others see no oak at all. Both styles can produce outstanding versions of BC's most planted white variety (2011 acreage report). Blue Mountain successfully combines the best of both worlds with 60% of the fruit fermented and aged in stainless steel and the remaining 40% in new-to-3 year old French oak. The blended wine brings together lively, citrus, apple, kiwi and white peach aromas and flavours with beautiful, rounded characters of orange blossom, wheat, vanilla, light spice and just a hint of warm brioche in the background. A lemon/lime acidic kick keeps the finish crisp and clean. A delightful Pinot Gris to be enjoyed now, or over the next 2-3 years. Drink now-2017. This beautiful Sparkling Wine Stopper preserves the fizz and flavour in sparkling wines for several days after opening by creating an airtight seal. ***SPECIAL OFFER! 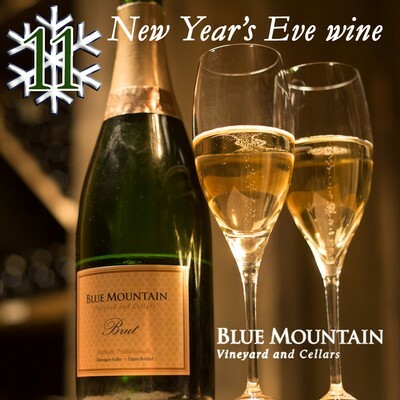 We are including a FREE Blue Mountain stopper with the purchase of a case of Blue Mountain wine consisting of at least one bottle of Sparkling, ordered on December 2nd. 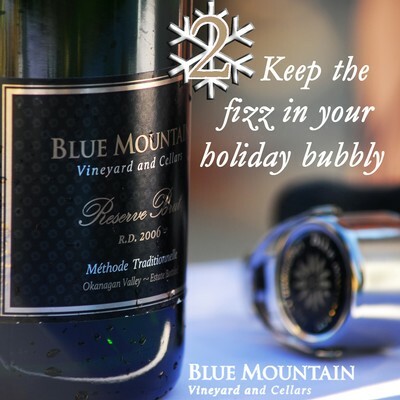 Add #bluemtnbubbly to your order notes. Day 3: Blue Mountain 2010 Brut Rosé R.D. Review: This terrific bubbly is mostly Pinot Noir with a bit of Chardonnay and gets the balance between complexity and freshness right. It's a beautiful wine to enjoy with oysters, seafood or even your festive turkey dinner. This glossy coffee-table book showcases 80 pages of Mike's stunning photographs of the Okanagan and features the iconic Blue Mountain Vineyard and Cellars view on the cover. To purchase contact Mike Biden at mikebiden@shaw.ca / 250-486-2112 or follow this link to purchase your copy online. At Blue Mountain we use natural corks as the closure for all our wines. Read more on 'How Wine Corks are Chosen' on our blog. Are you a corkscrew collector? Feel free to share a photo of your corkscrew collection, email it to bluemountain@bluemountainwinery.com and we will post it on our facebook page. ***SPECIAL OFFER! 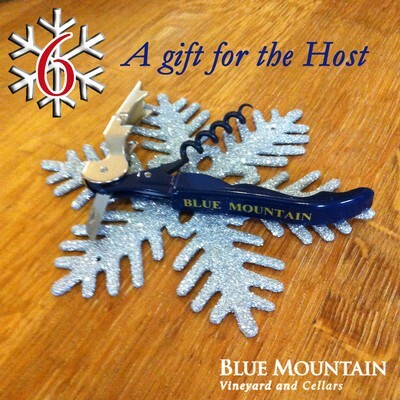 We are including a FREE Blue Mountain corkscrew with the purchase of a case of Blue Mountain wine, ordered on December 6th. Add #bluemtncorkscrew to your order notes. Review: We loved last year and edition 28 may be even better. Lively juicy fun and fresh on the nose and palate this wine is really over delivering. Two clones are behind this 50/50 mix of wine raised in wood and stainless steel. Love the lively citrus, mineral, green peach flavours flecked with guava and pear. Any type of shellfish works here and I’m thinking spaghetti vongole is the perfect match. A of bottle of wine (or sparkling wine) is always welcome, whether for the hostess, for your secret Santa or for under the Christmas tree. Make it extra special by choosing a creative way of wrapping the bottle of wine. Check out our Pinterest page -we've created a Pinterest board with some inspiration. For creative gift basket ideas - check Julianna Hayes' article on "Getting creative with gift baskets" via The Daily Courier. ***SPECIAL OFFER! 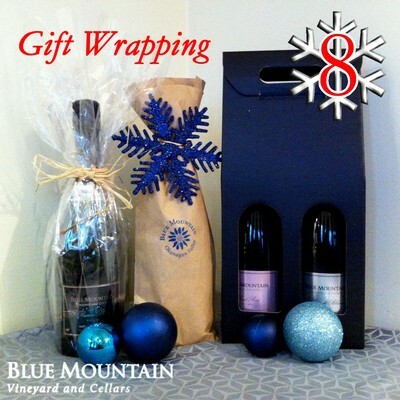 We are including a FREE Blue Mountain Tote bag with the purchase of a case of Blue Mountain wine, ordered on December 8th. Review: "Bone-dry and razor-sharp with acidity, this all-chardonnay beauty displays great depth of flavour, hinting at lemon pastry, green apple, honey and classic champagne-style tangy-toasty autolytic character. www.bluemountainwinery.com". Score 93 - Beppi Crosariol, globeandmail.com, November 2014. Articles: Click here to read "Top-notch wines just in time for the holidays" by Beppi Crosariol via The Globe and Mail. Unique Key Chain made with love by Creative Corkworks with upcycled Blue Mountain wine corks. To purchase contact Raelene Rozander at creativecorkworks@gmail.com, order on Etsy or visit the Penticton Visitors Centre. To see more of Creative Corkworks' products visit their facebook page. ***SPECIAL OFFER! We are including a FREE Blue Mountain key chain with the purchase of a case of Blue Mountain wine, ordered on December 10th. Add #bluemtnkeychain to your order notes. Review: "Just released in Ontario Vintages stores and also available direct from the winery, this non-vintage bubbly from one of Canada’s top Champagne-style producers is superb. A blend of mostly pinot noir with chardonnay and pinot gris, it’s bone-dry, rich and creamy, with a sherry-like tang and bread-like autolysis essence. Wonderfully yeasty, honeyed depth; $23.90 direct from the B.C. winery bluemountainwinery.com." Articles: Click here to read "Salut: Sparklers that shine" by Anthony Gismondi via The Vancouver Sun. 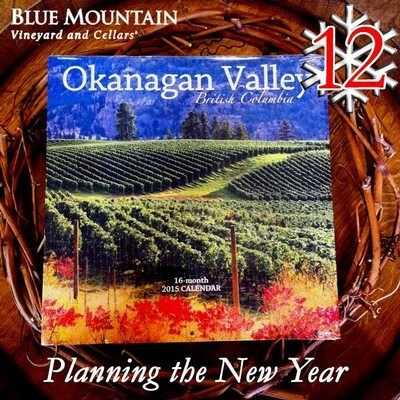 This beautifully photographed 12-month 12" x 12" wall calendar of the Okanagan Valley, British Columbia features Blue Mountain Vineyard & Cellars on the cover. To purchase follow this link. CONGRATULATIONS to Cathi Shaw, the winner of our 12 days of Christmas contest! A of bottle of sparkling wine is always welcome over the holidays, whether for the hostess, for your secret Santa or for under the Christmas tree. 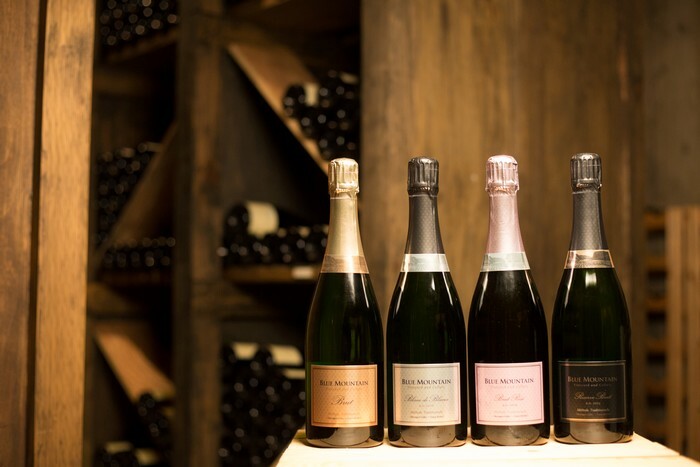 We have recently released our vintage sparkling wines - 2010 Brut Rosé R.D., 2006 Reserve Brut R.D. and 2007 Blanc de Blancs R.D. Are you looking for a retail location in the Lower Mainland, Whistler or Victoria where you can purchase some Blue Mountain vintage sparkling wines over the holidays? Our agent, Christine Fawcett at Keystone Fine Wines provided a great list of locations that will most likely have our Sparkling wines available this December. 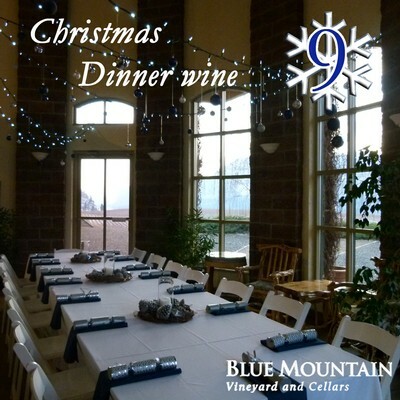 Email us a picture of Blue Mountain on your dinner table this holiday to bluemountain@bluemountainwinery.com and we will feature it on our facebook page! Available in Ontario are two of Blue Mountain's wines. Found in the LCBO Vintages, check their website to look up availability and find an outlet near you. "Just released in Ontario Vintages stores and also available direct from the winery, this non-vintage bubbly from one of Canada’s top Champagne-style producers is superb. A blend of mostly pinot noir with chardonnay and pinot gris, it’s bone-dry, rich and creamy, with a sherry-like tang and bread-like autolysis essence. Wonderfully yeasty, honeyed depth; $23.90 direct from the B.C. winery bluemountainwinery.com." "Medium-bodied and firm in the best sense, this serious white displays peach and tropical fruit drizzled with toffee, lifted by lemony acidity and subtle toastiness. Marvellous." Be sure to tell your friends and family in Ontario about these BC wines available in their local LCBO. Since May of 2013 Blue Mountain's Brut Sparkling has been available in Quebec's SAQ. "A great find from the Okanagan! Flavourful sparkling wine conveys aromas of apple and nectar-producing flowers. Excellent quality-price ratio." The SAQ website allows you to find a store near your location where the wine is available. 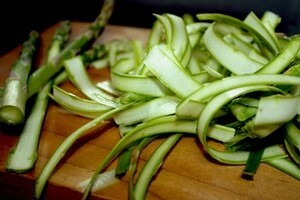 It also has some great recipe pairings to enjoy with the Brut Sparkling NV. So be sure to share this information with any friends and family in Quebec. Are you looking for a good spot to have lunch or dinner while visiting Oliver/ Osoyoos. Terrafina Restaurant is on the beautiful Golden Mile Bench in the heart of Oliver wine country. They serve Tuscan style food made with fresh local ingredients. 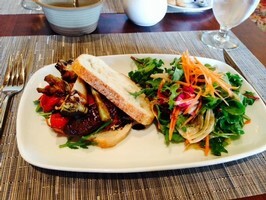 On April 24th Blue Mountain's tasting room staff had lunch at Terrafina and staff choices included Tuscan Salami and Mushroom, Roasted Vegetable Sandwich and Shrimp & Clam Tagliatelle. Their dinner menu includes delicious options such as Duck Confit and Blue Cheese Pizza, Braised Lamb Pappardelle Pasta, Hill Farms Oven Roasted Chicken and Pan Roasted Beef Tenderloin. Be sure to add Terrafina Restaurant to your next Okanagan culinary experience. The Okanagan Falls Winery Association’s annual Party in the Park is back & tickets are on sale now! 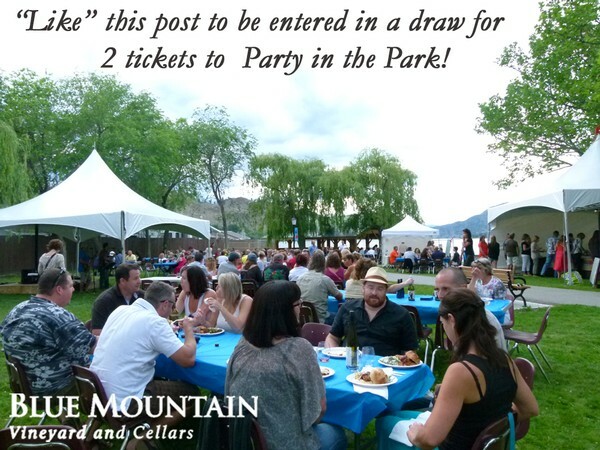 Also, Blue Mountain Winery is giving away 2 tickets to the event. To enter, find your way to our Facebook page, "like" us (please! ), like our post about the Party in the Park event & share it with your friends. Simple! A world of personally selected fine wine awaits your discovery… McCarthy and Schiering opened their first retail wine shop in 1980 and have spent over 25 years offering clients select wines that represent quality and value. McCarthy & Schiering Wine Merchants emphasize personal service in comfortable, friendly settings. 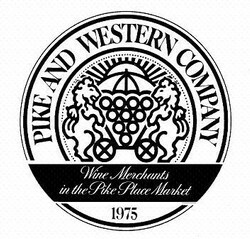 They carry an extensive selection of wines from around the world, specializing in wines from Washington and Oregon. Passionate about the small individual estates of France, Italy, Germany and Austria. New world wines from California, Australia, South Africa, New Zealand, and Argentina are well represented on their shelves. McCarthy and Schiering publish a weekly news email and a monthly newsletter. Click here to join. 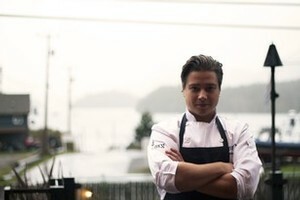 Shelter restaurant in Tofino offers the basics - food, wine, shelter - at its best. Shelter combines a sophisticated seasonal menu with a relaxed attitude and panoramic view. At Shelter Restaurant they use local, organic ingredients and ethically raised, all-natural meats whenever possible. The salmon, halibut, and prawns are caught by Tofino's fisherman. The poultry is free run and farmed on Vancouver Island. Shelter offers hormone free, grass-fed beef, as well as anti-biotic and hormone free pork, including bacon from the Fraser Valley. Located behind the restaurant is a garden they have started in 2010 that supplies produce and fresh herbs to the kitchen and bar for many months of the year. In addition, they have implemented an extensive two-tier composting program as well as a rainwater catchment system that helps reduce their dependency on the delicate municipal water source. Shelter aims to minimize their global footprint and are happy to be able to work with like-minded suppliers. With the help of the Tofino Ucluelet Culinary Guild, they are consistently moving forward in the world of sustainability and local cuisine. 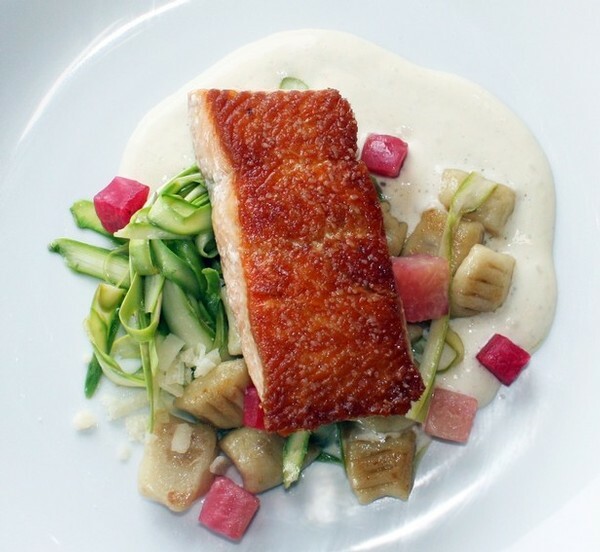 "After all there is no more a gracious host than one who shares with their guests that which their habitat has provided"
Chef Matthew Kane has provided a great Pan Roasted Spring Salmon, roasted garlic emulsion, marinated asparagus & gnocchi recipe to pair with Blue Mountain Chardonnay. "To pair with the Blue Mountain Chardonnay, I have chosen a very springtime dish to compliment it’s crispness, but also chose to add some richness to the dish to compliment its buttery finish. The cream in this recipe lends really well to the hints of vanilla found in this light Chardonnay", Chef Matthew Kane - Shelter Restaurant, Tofino. Time Lapse of the vineyard at Blue Mountain Vineyard and Cellars looking south over McIntyre Bluff. Created by our 2013 Tasting Room Intern, David Schafer. 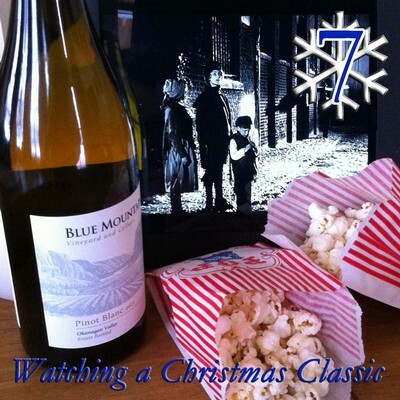 The Blue Mountain tasting room is open May - October, 7 days a week from 11am - 5pm.